Nueva York, años veinte. Los gángsters dominan la ciudad. 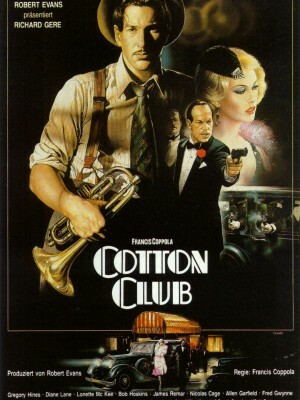 Sus centros de reunión suelen ser selectos clubes donde se escucha el mejor jazz, como el Cotton Club. Amor, música y crimen, unidos en una sola película. Richard Gere, Gregory Hines, Diane Lane, Lonette McKee, Bob Hoskins, James Remar, Nicolas Cage, Allen Garfield, Fred Gwynne, Gwen Verdon, Lisa Jane Persky, Maurice Hines, Julian Beck, Novella Nelson, Laurence Fishburne, Tom Waits, Ron Karabatsos, Glenn Withrow, Jennifer Grey, Wynonna Smith, Thelma Carpenter, Charles 'Honi' Coles, Larry Marshall, Joe Dallesandro, Ed O'Ross, Frederick Downs Jr., Diane Venora, Tucker Smallwood, Woody Strode, Bill Graham, Dayton Allen, Kim Chan, Ed Rowan, Leonard Termo, George Cantero, Brian Tarantina, Bruce MacVittie, James Russo, Giancarlo Esposito, Bruce Howard, Rony Clanton, Damien Leake, Bill Cobbs, Joe Lynn, Oscar Barnes, Edward Zang, Sandra Beall, Zane Mark, Tom Signorelli, Paul Herman, Randle Mell, Steve Vignari, Susan Mechsner, Gregory Rozakis, Marc Coppola, Norma Jean Darden, Robert Earl Jones, Vincent Jerosa, Rosalind Harris, Steve Carfiso, John Carfiso, Domino, Patricia LeTang, Christopher Lewis, Danielle Osborne, Jason Papalardo, Demetrius Pena, Priscilla Baskerville, Ethel Barry, Sydney Goldsmith, James 'Buster' Brown, Ralph Brown, Harold Cromer, Bubba Gaines, George Hillman, Henry 'Phace' Roberts, Jimmy Slide, Henry LeTang, Charles Young, Skip Cunningham, Luther Fontaine, Jan Mickens, Lydia Abarca, Sarita Allen, Tracey Bass, Ethel Beatty, Jacquelyn Bird, Shirley Black-Brown, Lester Brown, Benny Clorey, Sherry Cowart, Karen DiBianco, Cisco Drayton, Anne Duquesnay, Carla Earle, Wendy Edmead, Debbie Fitts, Terri Griffin, Robin Harmon, Sonya Hensley, Dave Jackson, Gail Kendricks, Christina Kuvi Kimball, Mary Beth Kurdock, Paula Lynn, Bernard Manners, Bernard Marsh, David McHarris, Delores McHarris, Alice Anne Oates, Anne Palmer, Judy Pars, Antonia Pettiford, Valerie Pettiford, Janet Powell, Renee Rodriguez, Tracey Ross, Kiki Shepard, Gary Thomas, Mario Van Peebles, Karen Wadkins, Ivery Wheeler, Donald Williams, Alexis Wilson, John P. Ryan, Howard 'Sandman' Sims. Francis Ford Coppola (Dirección), Stephen Goldblatt (Montaje), Mario Puzo, William Kennedy, Francis Ford Coppola (Guión), John (I) Barry (Música).